Miles just hasn't really improved at the end of games. Bummer. Credit were credits due - Cofey was a man. Sometimes the game is bigger than basketball and winning and losing - good for the young man on minnesota’s Team to get a win for his mom. It's the pet peeve of mine again. No idea what a foul is or is not a foul. One trip you brush a guy, it is a foul. The next trip you get to tackle the guy with no foul. The blown goaltend. For all the rough calls, we needed to go to zone. We got outcoached. these bogus charge calls on Palmer are getting old!!! man it pisses me off!!! takes him completely out of his game, I don't think any have been the correct call either..
Frustrating loss, this one will sting for awhile that's for sure. I'm not sure what happened to our defense but we had no answer for Coffey..
No 1-3-1 in the second half? I thought we rolled that out to protect some of our guys in foul trouble. I wonder if that will be asked in the post game. Palmer had no business guarding Coffey. A step, or two, slow all night on the kid. I guess I'm not sure who he would have switched with though. Long season, lets get'em on Saturday. BIG is going to be a grinder this year. defeat from the jaws of victory. quintessential NU. Love miles, love this team, this loss doesn’t kill us but we got miles”ed tonight. Real easy adjustment that woulda won this game is throwing out some more zone. Got screwed by the stripes tonight but we should be getting used to that. Better get over this loss in a hurry or Saturday will be hard to stomach. Needed it when they started sniffing a run. Was yelling at my TV the whole time. That was really depressing - primarily in the fact that we had the game won and just pissed it away. My two overriding comments are that we tried to take the air out of the ball WAY too early. Was driving me crazy to have us walking the ball up the floor with 10 minutes left. We play much better when we are trying to force the action. Also is always a killer for us to just cross half court before the shot clock hits 20. Our half court offense is not good enough to try to be consistent scoring when the other team only has to play defense for 20 seconds. Second - Palmer needs to learn that he has to show up every night. Difference between him and Coffey tonight was one of them showed up and played hard and the other was just going through the motions. Unfortunately the one that played hard was not wearing red. Brutal loss. Big game Saturday for Miles and this team . Quite possibly his last chance to get the monkey off his back if he gets let go or McDermott finds himself knee deep in trouble. 1. 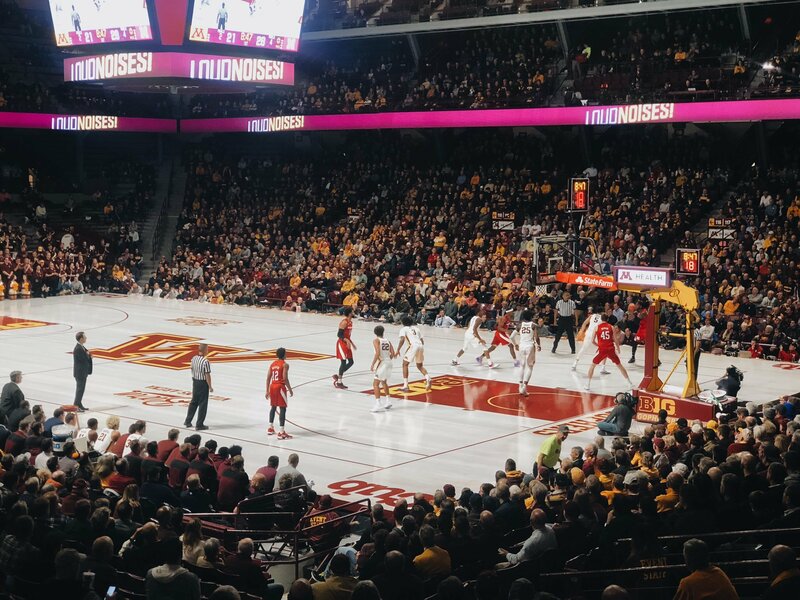 Minnesota is a much improved team. They are not bad. 3. We are more talented and more experienced. 4. We controlled the game and found ways to lose. Inexcusable loss. some bad calls, but ultimately that was a meltdown. palmer and roby better start knocking down some 3s, or we're going to lose a lot of games. both guys hovering around 20% for the season after tonight. Palmer struggled tonight. He is in a tough position when they call games like tonight. His 2 charge calls were iffy at best. After the 1st one, Murphy goes down, lowers his shoulder into Roby, and nothing is called. I bet we have to lead the nation in charges called against us, especially compared to the amount of blocks called on the other team. Having said that, we have to play through that. We seemed to stop running any offense down the stretch. We didn't switch to zone on defense. We need to hold serve at home and win a few road games. It's going to be a grind. Michigan survived Northwestern on the road, and Michigan was stomping everyone. Of course, last year, we went to Minnesota, and had one of our worst defensive performances of the year. We played very well on offense, and got the victory. This loss hurts because we should have won. Tough loss. I don't think that's the end of the world, but some problems from last year reared their heads again. Going long stretches without a FG. Or a solid look. The 1-3-1 seemed to work to end the half, I don't know why we didn't go back to it to close the game. That was a big boy game for Amir Coffey. Which killed us. And effected JPJ on the offensive end. Brady REALLY impressed me. Very active and kept the ball high. We need to come out Saturday, punch Creighton in the mouth and show that they are learning from mistakes. These next two are going to be huge for us resume and confidence wise.